WASHINGTON (CNN) -- Shared responsibility. It's a phrase we've heard a lot from President Obama when discussing the massive economic problems the United States is facing. 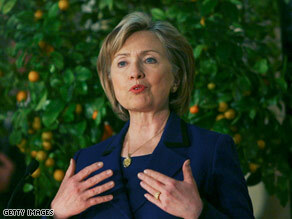 Secretary of State Hillary Clinton hopes to show that in every area, the U.S. partnership with Mexico is critical. But now it's the dominant theme of U.S. foreign policy, as Secretary of State Hillary Clinton heads to Mexico on Wednesday. Clinton is visiting Mexico City at a time when one of the only issues vaguely distracting the American public from the economy is the violent drug war raging just over the U.S.-Mexico border. The Obama administration's announcement of a crackdown on border violence and smuggling of cash and weapons into Mexico seems to mark an end to a nasty blame game over where responsibility for the violence lies. The Defense Department and director of national intelligence have warned about the national security threat an unstable Mexico poses to the United States. Congress is seized with the issue, holding no less than eight hearings since coming back into session two months ago. The headlines have reduced Mexico to a narco-state on its way to becoming a failed state. But U.S. administrations have called on successive Mexican leaders to crack down on the chokehold drug cartels have on the country. So the characterization of a failed state doesn't sit well with Mexican President Felipe Calderon, the first Mexican leader to stake his presidency on a military-led war on drug cartels. He argues the United States, as the world's biggest consumer of drugs coming from Mexico and the largest manufacturer of weapons used by drug cartels, shares some blame and should shoulder some of the burden. Army keeps peace in Mexico, but at what price? After watching more than 6,000 people killed in drug turf wars and attacks on security forces, the Bush administration did some soul searching last year and came up with the Merida initiative, a three-year $1.4 billion plan to help Calderon. The idea behind Merida, officials said, is the realization that since America is part of the problem, it should be part of the solution. Now it is the Obama administration's chance to turn what President Obama calls "shared responsibility" into action. In Clinton's meetings with Calderon and other Mexican leaders, she will make clear the United States is committed to working with Mexico and helping it come out of the drug war stronger. But her aides said she will also make just as much of a concerted effort to make sure the U.S.-Mexican relationship is not "pigeonholed" by the current drug violence. Mexico is the United States' second-largest export market after Canada, and its third-largest total trade partner. Hundreds of U.S. companies have factories in Mexico and Mexico is a leading supplier of crude oil to the United States. The 2,000-mile U.S.-Mexico border has about 1 million legal border crossings a day, with another estimated 12 million undocumented workers and their families living in the United States. Let's not forget that President Obama won two-thirds of the Hispanic vote in the election and many are hoping he will pass immigration reform to give more immigrants legal status. Mexico is a growing world economy and is in the G-20 group of nations. President Calderon will have a seat at the summit in London, England, next month along with President Obama. Bottom line, Mexico feels it deserves a little respect, and Calderon hasn't been shy about asking the United States to show it. Clinton seems prepared to do just that. Yes, she will visit a Mexican police base to show U.S. support for its embattled police force. But she will also travel to Monterrey, Mexico, a thriving industrial town near the U.S. border. She will meet with students, hold a town hall meeting with business leaders and visit a clean energy plant -- all in an effort to prove that in every area, the U.S. partnership with Mexico is a critical one. It will also signal the Obama administration does not believe Mexico is unsafe after gunmen fired shots at the U.S. consulate in October and November. As she tries to help curb the drug war, Clinton will also seek to avoid a trade war. Mexico's recent decision to slap tariffs on select U.S. imports was payback for a ban on Mexican trucks on U.S. highways. The move threatens some $2.4 billion in goods across 40 states. In these troubled economic times, it's another headache the Obama administration doesn't need. During Clinton's two-day trip, the tricky dynamics of the U.S.-Mexico relationship will be on full display. And it will be up to her to define a relationship for the Obama administration with a key ally who is no longer content to be the lesser of the two partners -- one the United States increasingly needs at every turn.